Amazin’ Graze: Healthier snacking made delicious! I’m not sure about you, but I have a constant urge to snack whenever I’m working in the office. Snacking optimizes my brain’s functionality and allows my creativity to flow smoothly! A few days ago as I was reaching for the snacks stashed on my desk, I became aware that my go-to options were extremely unhealthy – my snacks were sugary, had artificial flavourings and preservatives. I did a simple mental calculation in my head and found out that on average, I consumed about 356 kcal snacking on food that lacked nutrition. Knowing that I would be really upset if I attempted to ditch my snacking habit, I combed the internet for healthier snack options and stumbled across what seemed like the answer to my prayers (and many other ‘Office Snackers’ who would like to up their snacking game) – AMAZIN’ GRAZE! 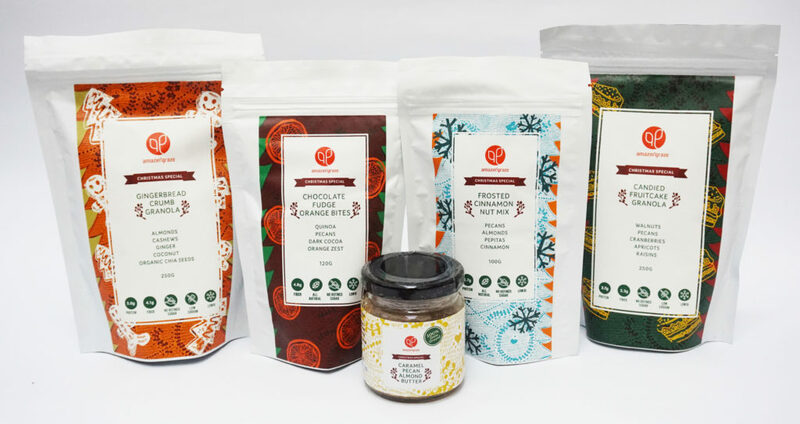 The fun-loving team behind Amazin’ Graze stands firm in their belief that snacking can be done in a healthy manner by incorporating quality, raw ingredients that are highly nutritious. Their wide varieties of invigorating snacks are freshly baked each week, ensuring that customers get to enjoy these delicious treats in their best conditions. No artificial preservatives, flavouring or colouring were added and none of their products contain refined sugars and salt. Besides sharing the joy of healthy snacking with their customers, Amazin’ Graze makes the effort to educate the local community on healthy living through workshops and yoga classes. Amazin’ Graze is filled with so much positive vibes, their customers can’t help but feel all warm and cozy when indulging in their amazing products. 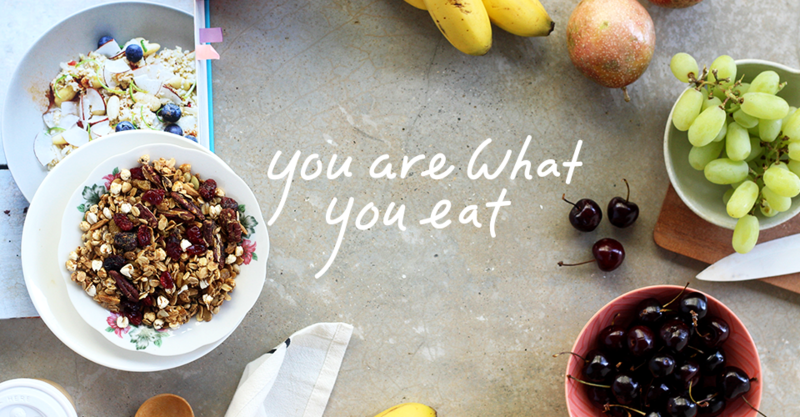 Amazin’ Graze has a wide offering, including granolas, nut mixes, nut butters and superfoods! They are all made with 100% natural ingredients, and suitable even for vegetarians! They also recently launched a free e-book containing 9 different recipes created using their products, so customers can get the best out of their purchase. Simply sign up for the e-newsletter on their site to get the free recipes! The perfect breakfast for chocolate lovers! 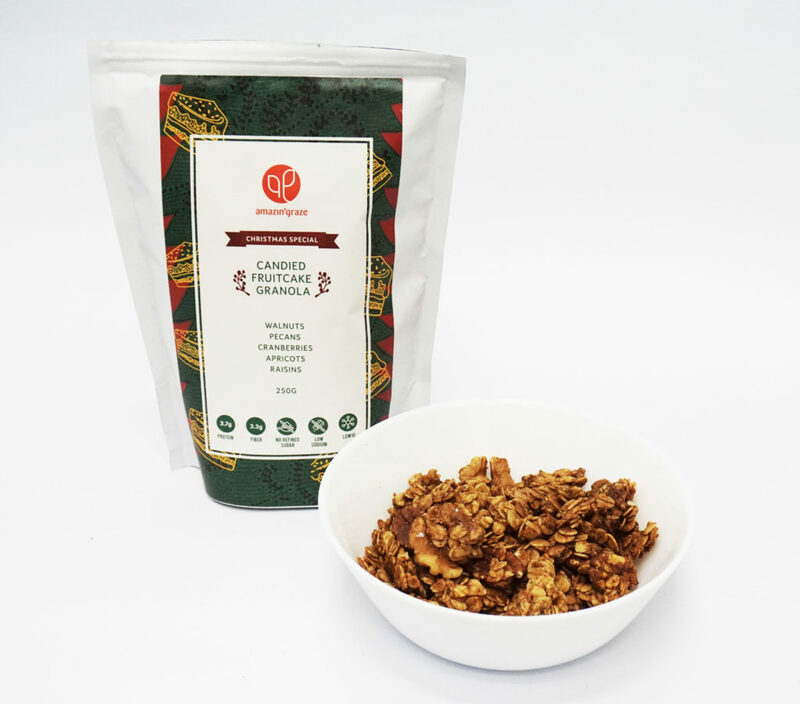 Containing wholesome ingredients such as organic chia seeds, buckwheat and cranberries, this granola mix is rich in antioxidants, fiber and protein needed to keep your blood pressure and cholesterol levels in checked! Comes in gluten-free variation as well! 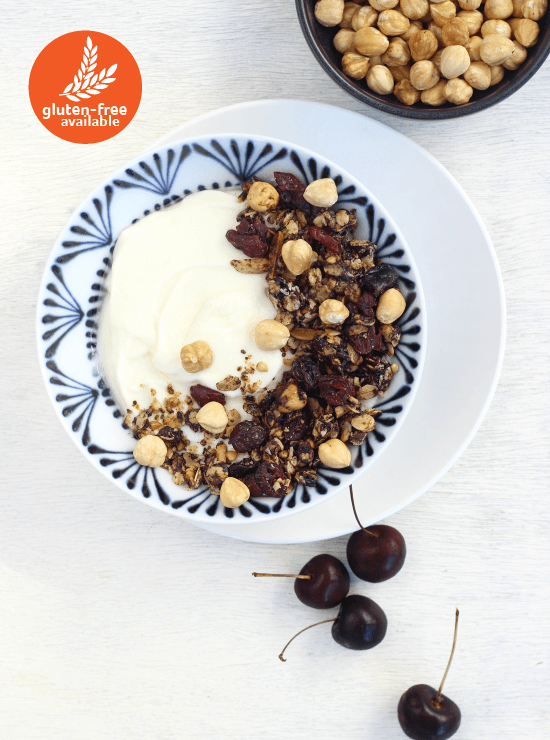 Start your day right with this 100% natural granola mix filled with organic chia seed, almonds, coconut, blueberry and goji berry! According to Amazin’ Graze, coconut flesh is rich in threonine, which makes it great for the liver, central nervous system and cardiovascular system. Comes in gluten-free variation as well! 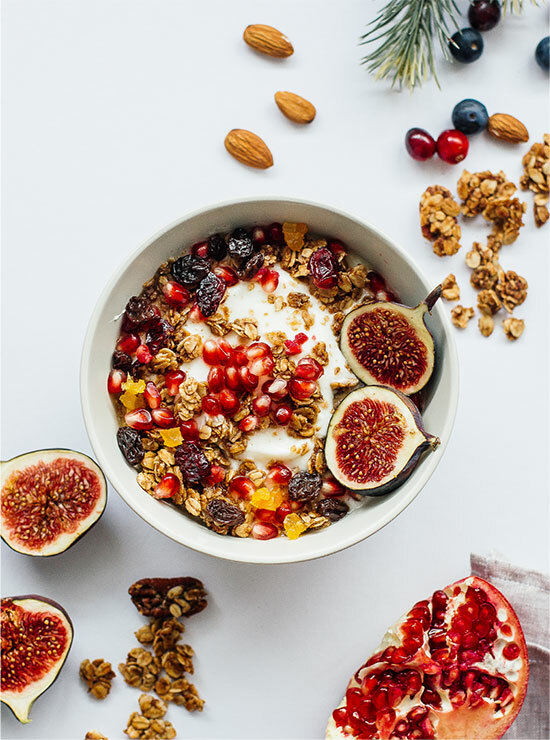 HealthLoco Tip: For the calorie conscious, try Amazin’ Graze Pink Raspberry Granola, which has the least calories (179 kcal per serving) out of the whole granola range! Amazin’ Graze also recommends the Salted Gula Melaka Granola, which has the lowest, sugar content out of the range. 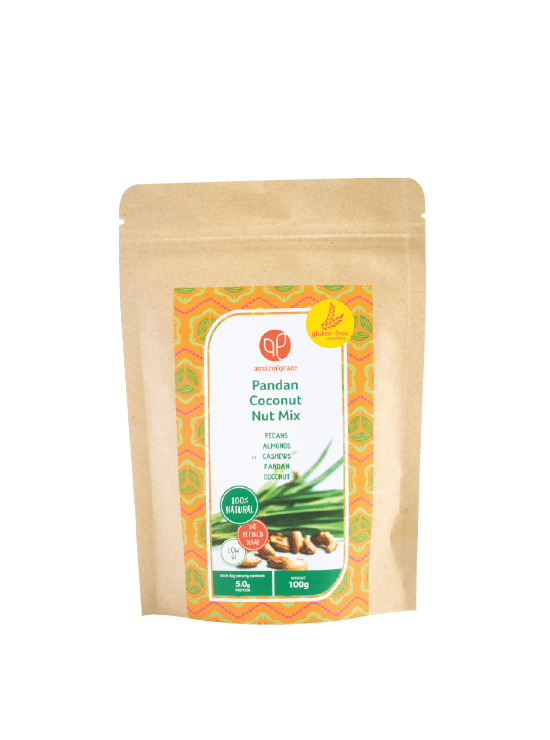 The combination of coconut and pandan gives this nut mix a familiar flavour of home! For those who are constantly craving something sweet (me! 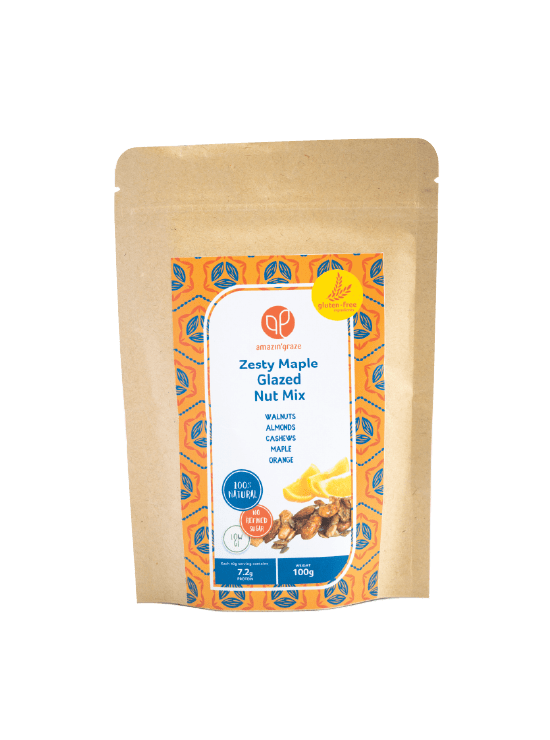 ), this nut mix is packed with fresh orange zest, maple syrup and an assortment of nuts to ensure you’ll be unconsciously reaching into the bag for more. HealthLoco Tips: For those who prefer something savory, try Amazin’ Graze new Tom Yum Kaffir Lime Nut Mix which is probably the closest it gets to a bowl of Tom Yum soup in the office! 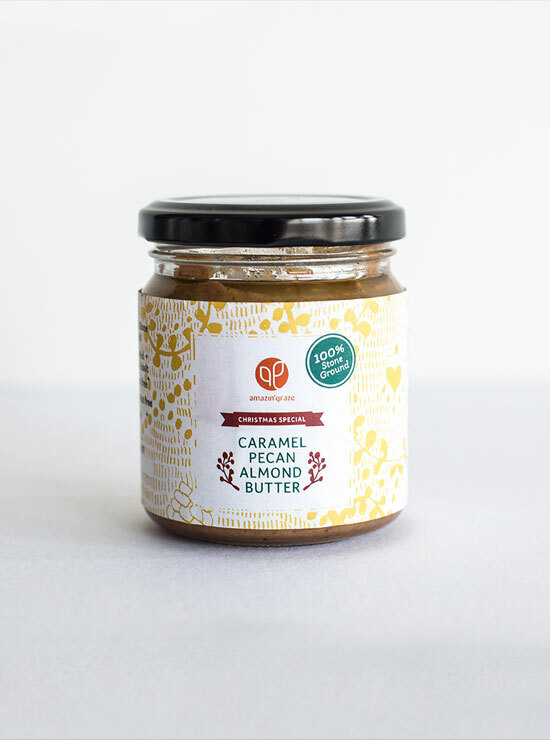 If you’re looking for healthy alternatives to your ordinary peanut butter or dips, the Amazin’ Graze nut butters will not disappoint. The nuts used are 100% stone grinded, giving the nut butters a silky smooth texture while preserving their nutrients and flavours. Possessing higher contents of iron, copper and magnesium, nut butters are richer in mineral than peanut butters and also contain more antioxidants to eradicate the damage caused by free radicals. 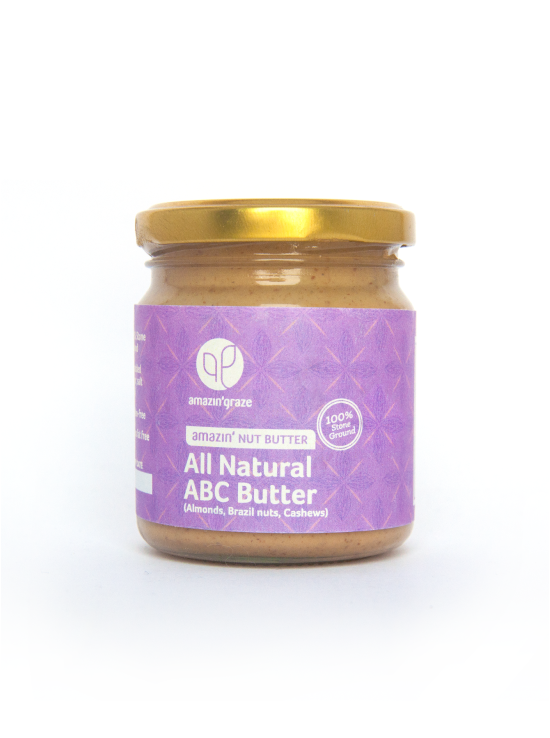 Tap on the nutrients of almonds, Brazil nuts and cashew through Amazin’ Graze ABC Butter! Christmas came early at HealthLoco when we found ourselves smitten with Amazin’ Graze Christmas flavours. The kind people at Amazin’ Graze sent us all 5 of their Christmas specials to try out, and here’s what we think about these delicious snacks! If Christmas were a food, this would be exactly how I imagined it to taste like. The comforting smell of sweet cinnamon glazed over pecans, almond and crunchy pepitas made it hard for us to resist emptying the bag of nut mix. If you’re a fan of cinnamon (we definitely are! ), this is the product made just for you! Besides being super addictive, cinnamons are rich in antioxidants and great for moderating blood sugar levels! 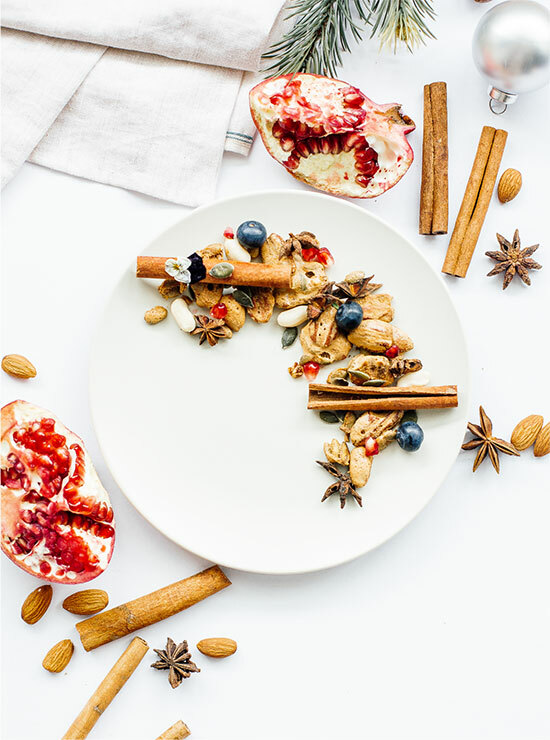 Our team absolutely adored this nut mix, and believe it will make the perfect healthy snack to serve your guests at the Christmas party! Dark chocolate fans rejoice! 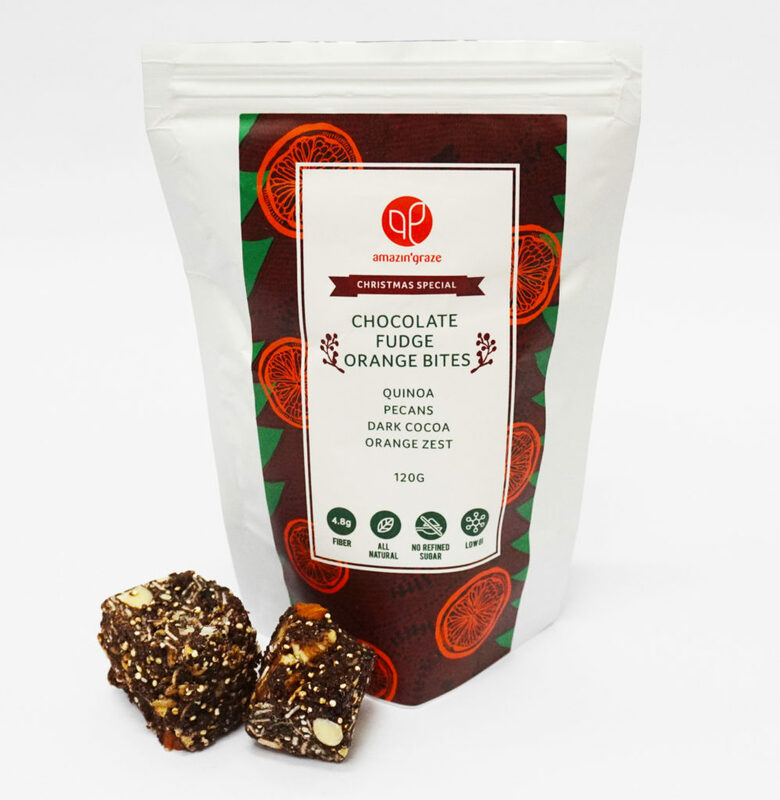 You can now snack on these chewy dark chocolate bites that will awaken your taste buds to the refreshingly strong taste of citrus! Dark cocoa is rich in antioxidants and beneficial for our hearts’ health. However, be prepared to drink loads of water after snacking on these because our team found it to be a tad too drying and it left us with a powdery and flat cocoa aftertaste. The bites were also sliced into blocks that were a little too big to ingest in one mouth, so do remember to break it up for the kids! What’s Christmas without gingerbread? 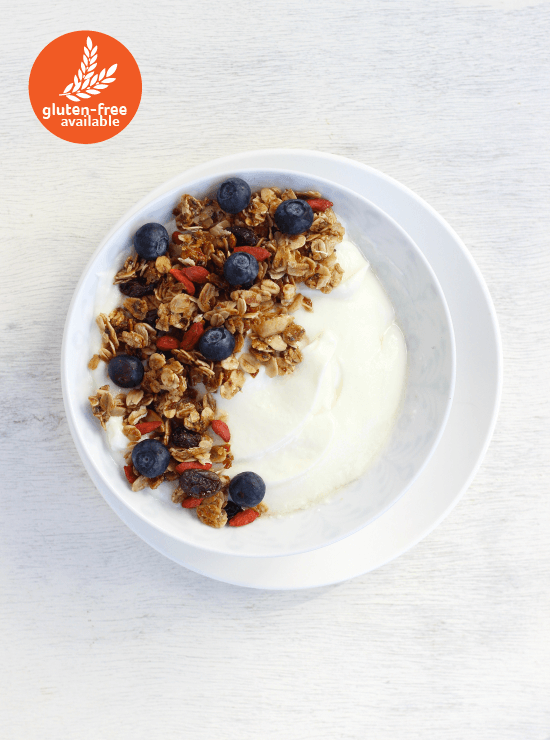 You can now enjoy this familiar flavour for breakfast in the form of granola! Ginger is an effective ingredient to alleviate digestive issues and fight inflammation and discomforts. The light and lingering taste of ginger and spices balanced out the otherwise plain granola taste. 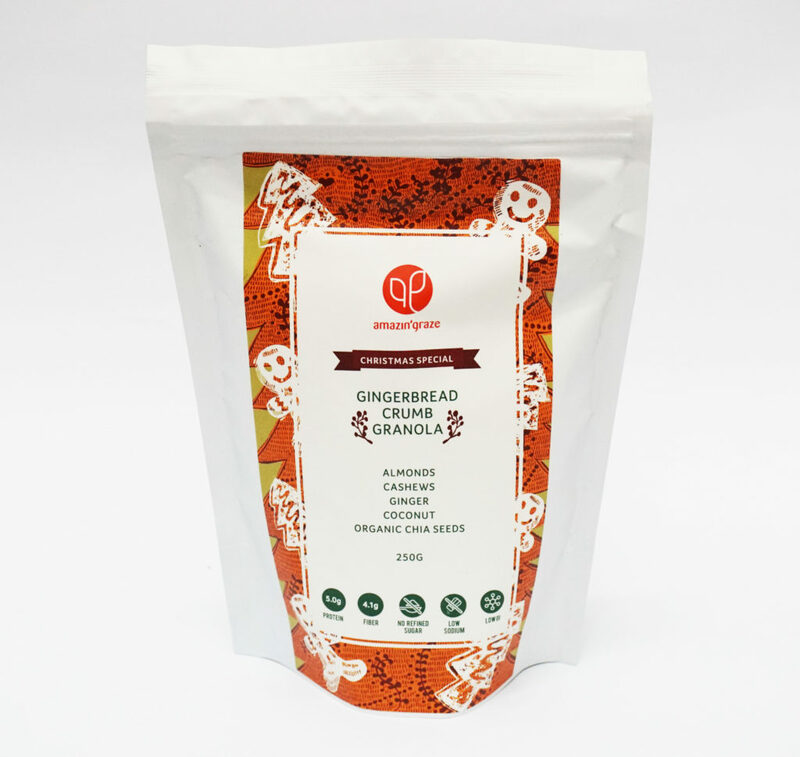 Despite so, we found ourselves wishing that the Gingerbread Crumb Granola could have a more distinct taste. Perhaps this flavour would be perfect for the older folks at home who would definitely appreciate the aromatic ginger scent! 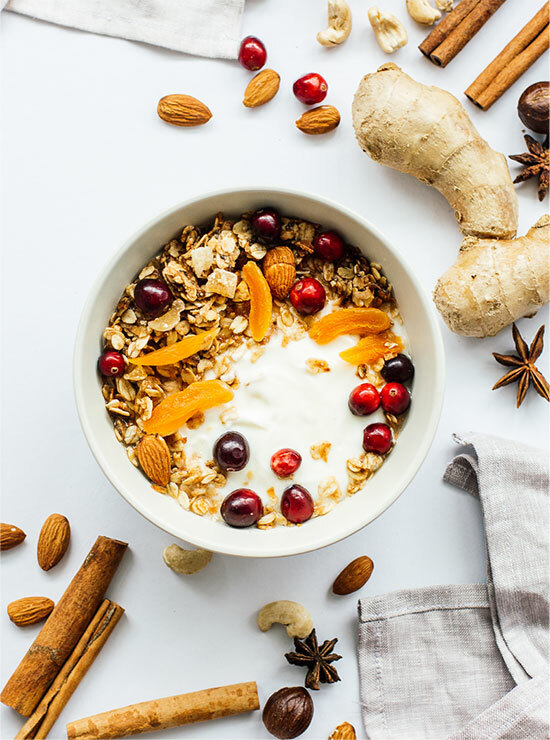 Another one of the most well received flavours among the HealthLoco team, we love how the rich and fruity flavours burst in our mouths the moment we chomped down on the crunchy granola. This tasted exactly like a fruitcake would! 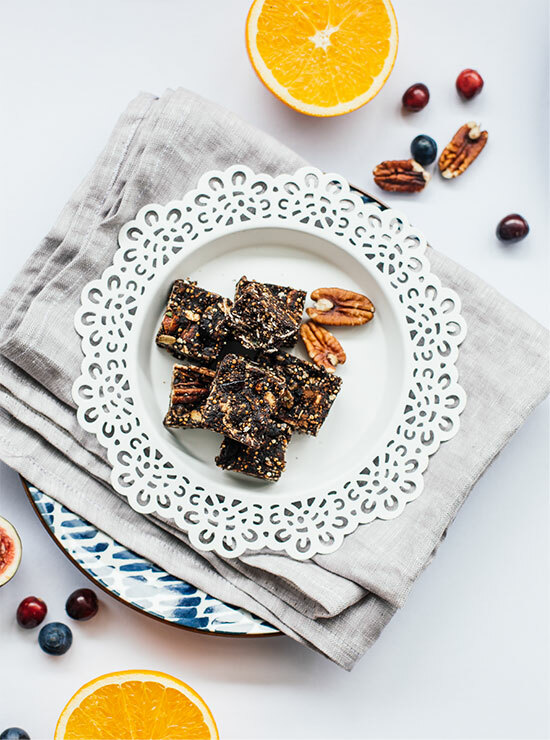 The candied dried fruits mixed harmoniously with the earthy flavours of the nuts, making this the perfect breakfast for a pick me up! Other than its delicious flavours, dried fruits are low in sodium and rich in potassium and fiber. They help to stabilize our blood pressure and sugar levels! Amazin’ Graze wasn’t joking when they said that their nut butters were smooth and creamy. This was a dream to spread, but the nutty taste we were anticipating did not emerge. Instead, our taste buds detected a fragrant and light coconut flavour. This is a spread great for days where you don’t feel like eating something too sweet and heavy! In addition, the pecans used to make the spread are packed with healthy unsaturated fats and rich in vitamin E as well as manganese that maintains bone health. Where can I get these Amazin’ products? You can get your hands on their freshly made products on Amazin’ Graze website, or drop by their store to learn more about their products! For customers based in Malaysia, click here to find out where you can locate Amazin’ Graze! Connect with Amazin’ Graze through their Facebook Page or Instagram! 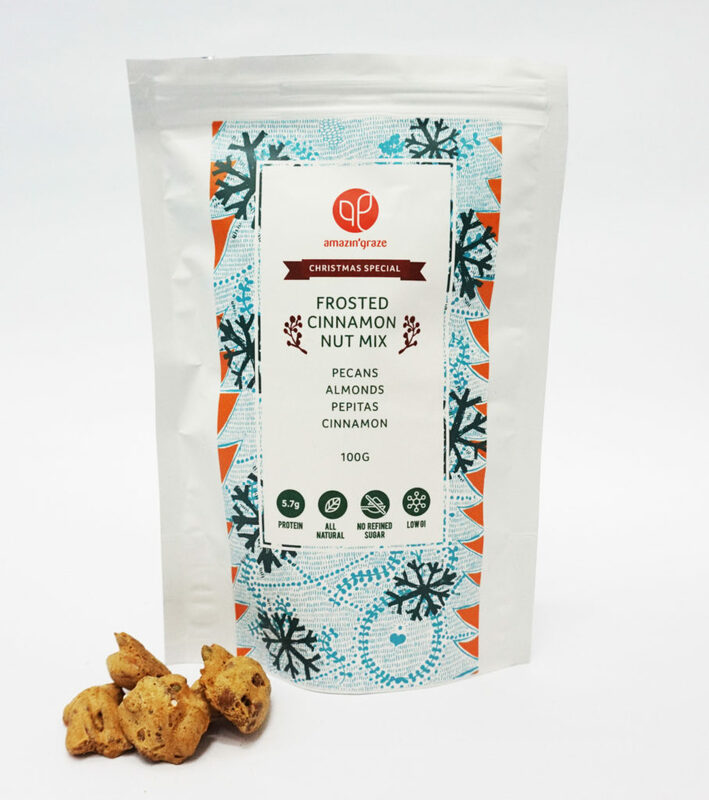 Treat your loved ones (or yourself) to some delicious Christmas flavoured snacks this festive season! 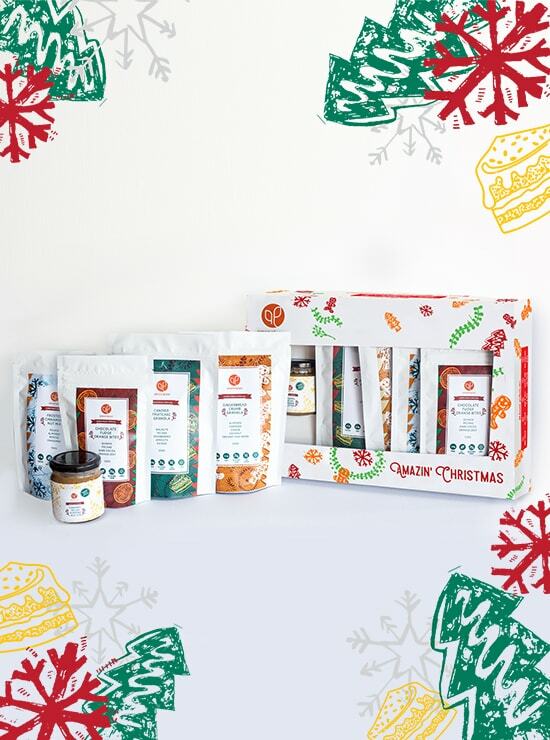 In collaboration with Amazin’ Graze, HealthLoco is giving away 1 set of Amazin’ Christmas Indulgent Gift Box (worth S$49.90)! Head over to HealthLoco’s Facebook page to see how you can participate! This giveaway will end on 12 December 2017.